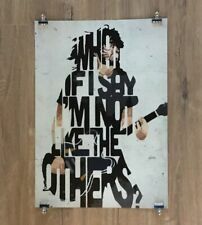 Foo Fighters Dave Grohl A2 size typography art print/poster Premium Quality. 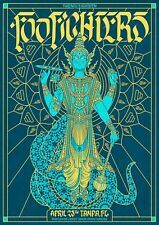 Printed on premium silk art poster paper with vibrant long life Canon Inks. Overall size: 420 x 594mm (42 x 59.4cm) Looks amazing framed. Brand New. Shipped in an ultra strong parcel. Dispatched with Hermes Tracked and insured. Produced using HIGH QUALITY card. A stunning new art print inspired by the fantastic 2002 fourth studio album `One by One` by the Foo Fighters. Title : "Foo Fighters, One by One". Limited edition art print of 295 signed by the artist who created the art print and not the band/artist featured in the design. Title : "Foo Fighters, Platinum". Features : Signed and numbered (of 295) on the reverse by the graphic/digital artist.